NEW YEARS EVE 2017 PARTY! 1 DAY - 1 EXCLUSIVE EVENT! 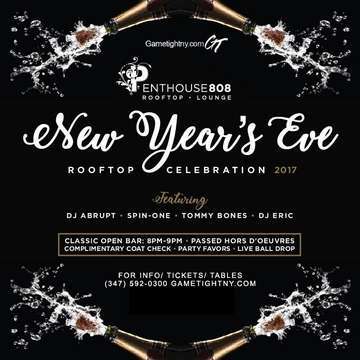 NEW YEARS EVE SILVER BALL AT RAVEL PENTHOUSE 808 WITH MUSIC BY NYC HOTTEST DJS DJ ABRUPT, DJ SPIN ONE, TOMMY BONES, DJ ERIC @ PENTHOUSE 808 NYC NYE ROOFTOP QUEENS NYC PARTY! TICKET EVENT 21 & OVER! GALA NEW YEARS'S EVE PARTY @PENTHOUSE 808 AT RAVEL HOTEL NYC IN ASTORIA QUEENS, NY! CAPACITY EXPECTED!! ID a must. 21 & over - Doors open at 8pm!